This old town centre is known for it's medievel and romantic flair throughout Europe. Since the 13. July 2006 is the old town centre of Regensburg an UNESCO- word heritage. Our hostel is very central and you can reach everything in the old town by feet! 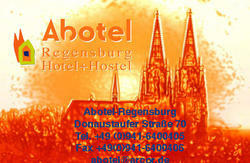 The city also offers a wide range of culinary choice and Regensburg has the highest concentration of pubs in Germany! The rooms are all with shared bathrooms and toilets! 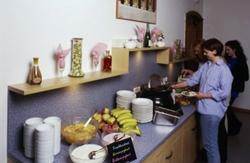 In every area you have a common room and a kitchen! Whether you want to spend an exciting night with friends, strangers, your partner or your colleges in the medievel centre of the old town and your are looking for a cheap accomodation, come to us! In the summer we also open on Sundays! Check-in is of course also outside the opening hours possible! YOU WILL HAVE TO TELL US IN ADVANCE IF YOU COME ON A SUNDAY/HOLIDAY OR LATER THAN 7PM!!! The hostel is located in the old town centre. Just next to the Thurn & Taxis Palace. It`s just a ten minute walk from the main bus and train station. LATE CHECK-IN ONLY AFTER ARRANGEMENT!! !